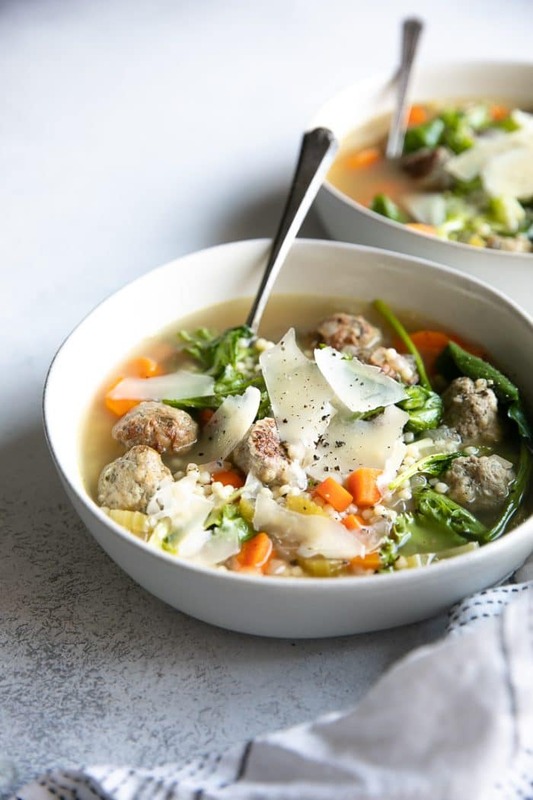 Filled with simple and nutritious ingredients, Italian Wedding Soup is a comforting Italian soup filled with leafy green vegetables, meatballs, and small pasta in a clear chicken broth. Loved by the whole family, enjoy a big bowl of this Italian Wedding Soup with buttered bread and a side salad for a complete meal. When the temperature drops and rain is forecasted for 10 days straight, I make soup. Comforting, delicious, and easily made in bulk, soup is my favorite way to warm up from the inside out. 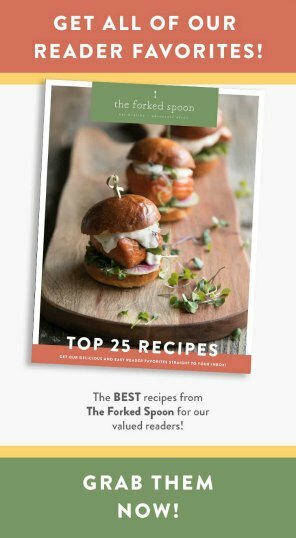 From classics like Chicken Noodle and Minestrone to reader favorites like this Bok Choy Soup and Leek and Potato Soup, there’s no shortage of soup recipes being cooked in TFS kitchen. Meatball soup, however, like this Mexican Meatball Soup and Thai Meatball Soup, are some of my personal favorites. As such, it only made sense that I share my very favorite Italian Wedding Soup with you guys! Even my toughest critic, my 5-year-old, loves this extra healthy soup. 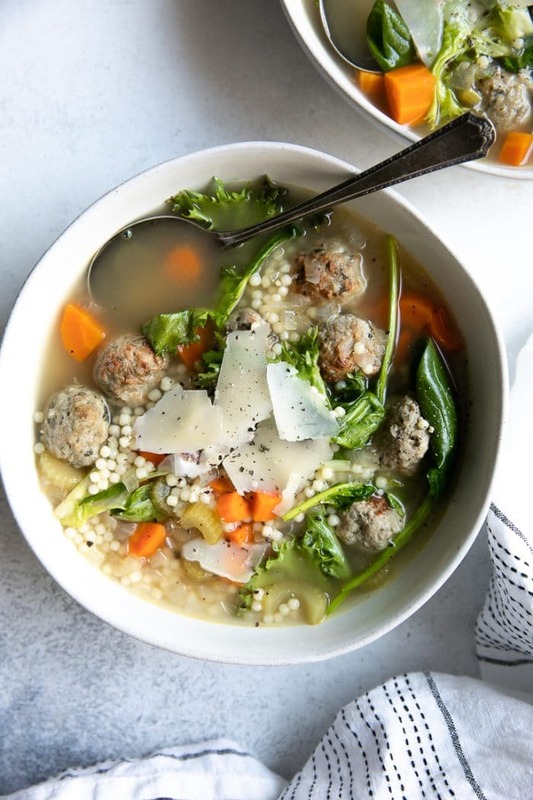 Filled with fun little meatballs, teeny-tiny little pasta balls, and a nourishing broth, Italian Wedding Soup is a frequent request and an all-around family favorite. What is Italian Wedding Soup? 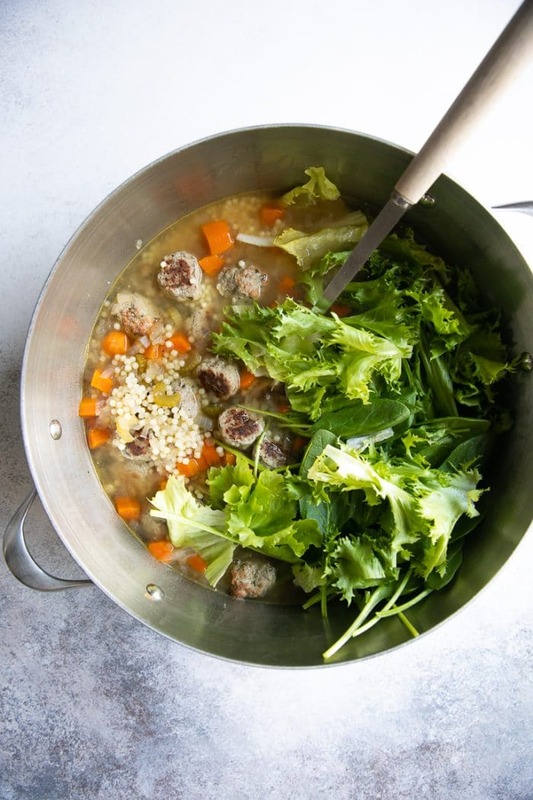 A popular Italian-American comfort food, Italian Wedding Soup, or just Wedding Soup, is made with meat (usually meatballs) and some kind of leafy green (endive and escarole being the most “traditional”). These days you’ll often find some kind of small pasta like acini di pepe in Italian Wedding Soup, but earlier versions were usually served with extra meat instead of pasta. The term “wedding soup” is derived from the Italian phrase, “minestra maritata” or “married soup”. Somewhat confusing, this soup is not a popular wedding menu choice but is instead refers to the combination or “marriage” between the greens and the meat and the flavor it produces. Italian Wedding Soup has two ingredient groups- the meatballs and the soup. What kind of Pasta is used in Italian Wedding Soup? Most often you’ll find Italian Wedding Soup served with acini di pepe pasta. These tiny little pasta balls look like pearl couscous and make a really fun and delicious addition to the soup as it helps add to, rather than take over, the flavors of the soup. If you can’t find acini di pepe, other great pasta options include orzo and ditalini. 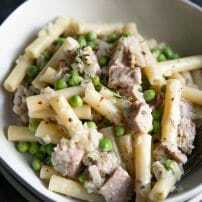 Do you cook the pasta in the soup or separately? 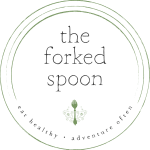 Since I knew that my family of three would not be able to polish off an entire pot of soup in one sitting, I chose to cook the pasta separately and add it to each bowl at serving. This is completely optional and (I admit) somewhat unnecessary given the minimal surface area of the pasta (translation- less chance that the pasta will turn soggy like other pasta noodles). Before getting started on the soup, let’s make some meatballs. 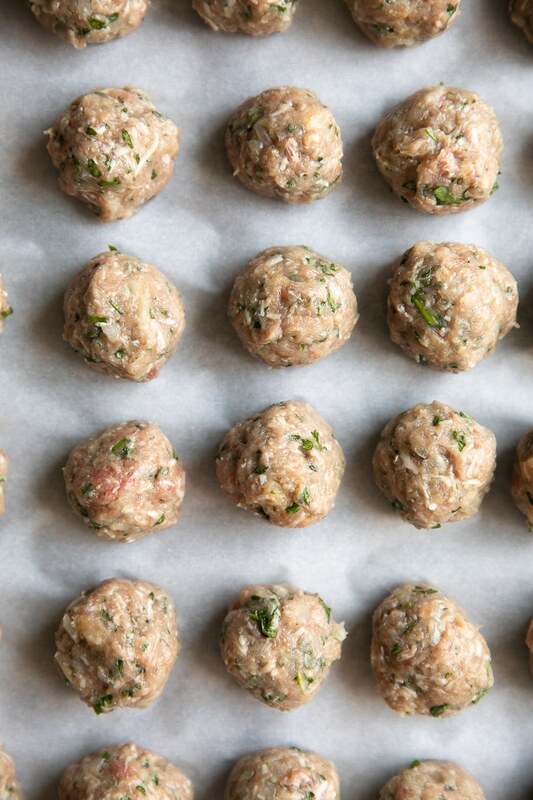 Unlike many meatball recipes, the meatballs in Italian Wedding Soup are teeny tiny. Ok, not that tiny, but try to limit each meatball to 2-3 teaspoons of meat mixture per meatball. Can they be larger? of course. 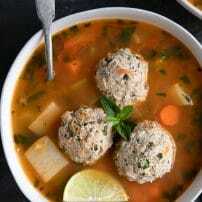 However, traditional Wedding Soup recipes will come with small meatballs. Once you’ve mixed together all the ingredients for the meatballs, you have three cooking methods – bake, pan-fry or boil directly in the soup. For this recipe, I chose to bake the meatballs before adding them to the soup. It’s a little extra work, but I like that some of the extra fat has a chance to drip off. 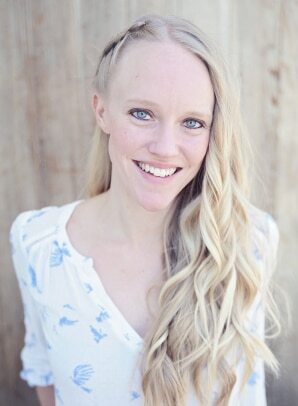 Besides, the golden outside with the soft, juicy inside is always amazing. As the meatballs are baking, start that soup. Start by cooking the onions, carrots, and celery in a large pot or Dutch oven over medium-high heat until they are soft and the onions are translucent. 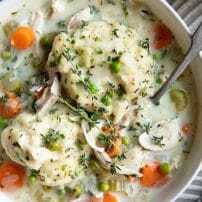 Mix in the garlic, chicken broth, and white wine (if using). Dry white wine, you guys, not a sweet wine. Look for a sauvignon blanc or pinot grigio. Once your soup comes to a boil, add the pasta (unless you decide to cook that separately) and cook for approximately 5-6 minutes. By this point, your meatballs should be cooked (yayy! ), so drop those into your pot of simmering soup and return to a boil. Approximately 5 minutes before serving stir in your fresh greens (whatever tickles your fancy) and serve with fresh shaved Parmesan cheese. 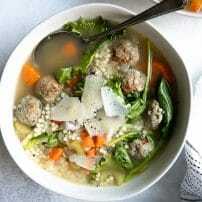 Can you make Italian Wedding Soup with Frozen Meatballs? 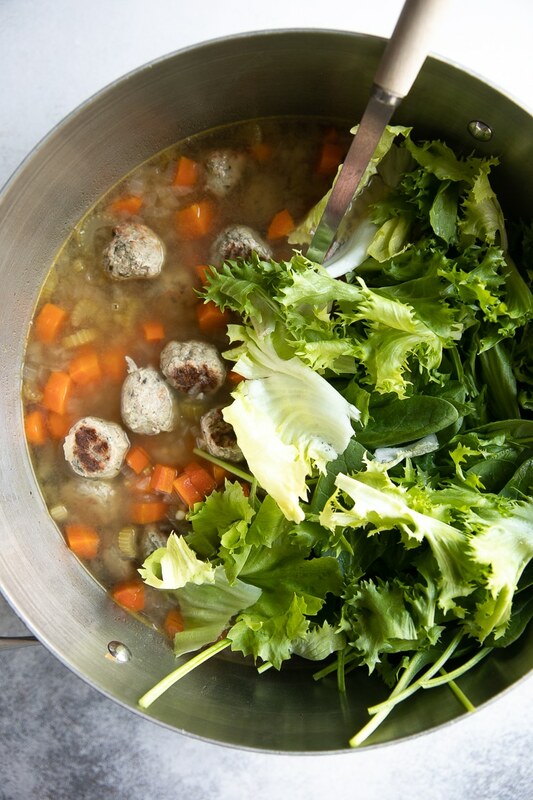 You can easily cut the total time to make this soup in half by using frozen meatballs. I always love to make extra meatballs and freeze half that way they’re ready to go whenever I’m in the mood for a cozy bowl of soup (or my favorite tiny little human requests his favorite meatball soup). If you don’t have any homemade frozen meatballs on hand, store-bought meatballs will work just as great! Just be sure to pick up mini meatballs if you can find them! Since this makes a huge batch of soup, I know many of you may be wondering if you can freeze any of the leftovers. Yes, you can definitely freeze the leftovers. To do so, allow your soup to cool in the refrigerator completely before transferring to freezer-friendly containers or double-bag in freezer-friendly zip-lock bags. Remove most of the air, leaving just a small amount of space to allow the liquid to expand as it freezes. I highly recommend freezing without the pasta and (if possible) the greens. This will ensure that the reheated soup tastes just as fresh the second time around. To reheat, allow the frozen Italian Meatball Soup to thaw in the fridge overnight. Transfer to a pot and cook until heated through. If, like me, you chose to eat this soup without freezing, it’s best to enjoy within 4-5 days, thoroughly reheating each time. 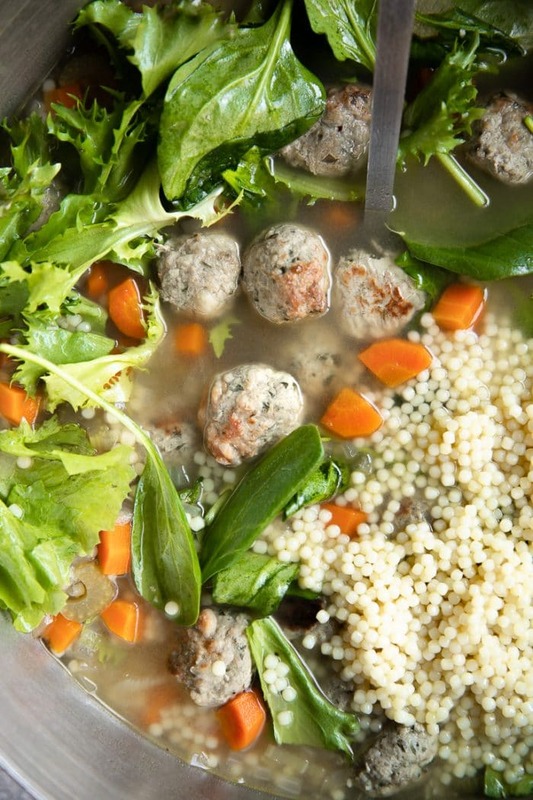 If you try making this Italian Wedding Soup Recipe, please leave me a comment and let me know! I always love to hear your thoughts. DON’T FORGET TO PIN AND SHARE THIS EASY AND DELICIOUS ITALIAN WEDDING SOUP AND ADD IT TO YOUR NEXT WEEKLY MEAL PLAN! Filled with simple and nutritious ingredients, Italian Wedding Soup is a comforting Italian soup filled with leafy green vegetables, meatballs, and small pasta in a clear chicken broth. Preheat oven to 400 degrees F. and line two large baking sheets with parchment paper. Set aside. 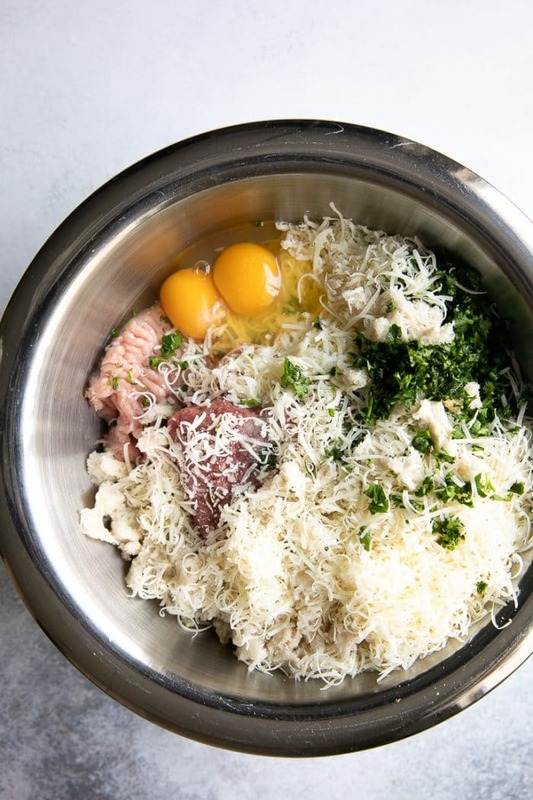 Transfer all ingredients for the meatballs to a large mixing bowl. Use your hands to thoroughly combine all ingredients for the meatballs together. 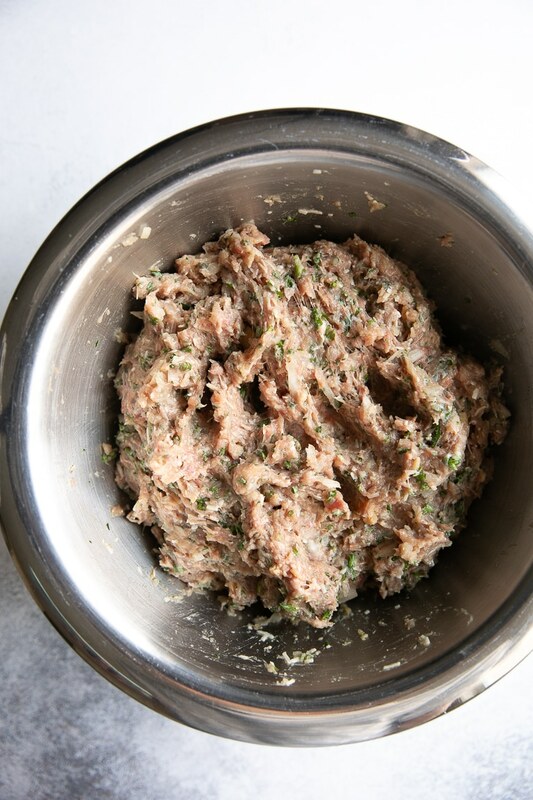 Using approximately 1 tablespoon of the mixture for each meatball, shape the meat mixture into 1-inch-diameter meatballs and transfer to the prepared baking sheets. Bake for approximately 20 minutes, or until tops are golden and meatballs are just cooked through. Set aside. As the meatballs are cooking, begin preparing the soup. Heat the butter and olive oil in a large pot or Dutch oven over medium-high heat. Add the onion and cook for approximately 3-4 minutes, or until soft and translucent. 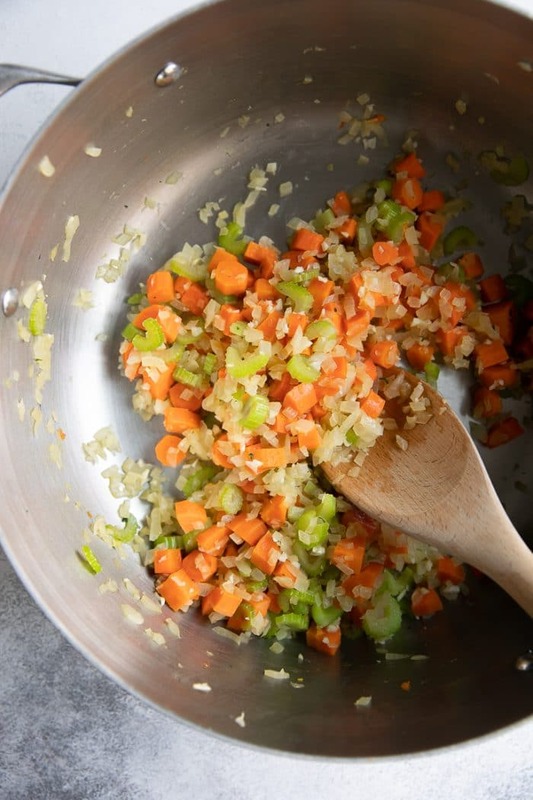 Mix in the carrots and celery and continue to cook for 6-8 minutes, stirring often. Add the garlic and salt and sauté for an additional 1 minute, stirring continuously to prevent the garlic from burning. Add the chicken stock and the wine to the vegetables and bring to a boil. Reduce to a simmer and add the acini di pepe pasta to the soup. Stir well to combine. Allow the pasta to cook for approximately 5-6 minutes, stirring often. Add the cooked meatballs to the pot and return to a simmer. Stir in the fresh greens (curly endive, escarole or spinach) and allow soup to cook until greens are wilted. Serve soup garnished with Parmesan cheese if desired. I used two thick slices of fresh sourdough bread for the meatballs, but any white bread will work. You want approximately 2 cups of torn up bits and pieces of bread. If you don't think you'll be eating all the soup in one sitting, I recommend cooking the pasta separately and adding to individual serving bowls rather than cooking the pasta in the soup pot. 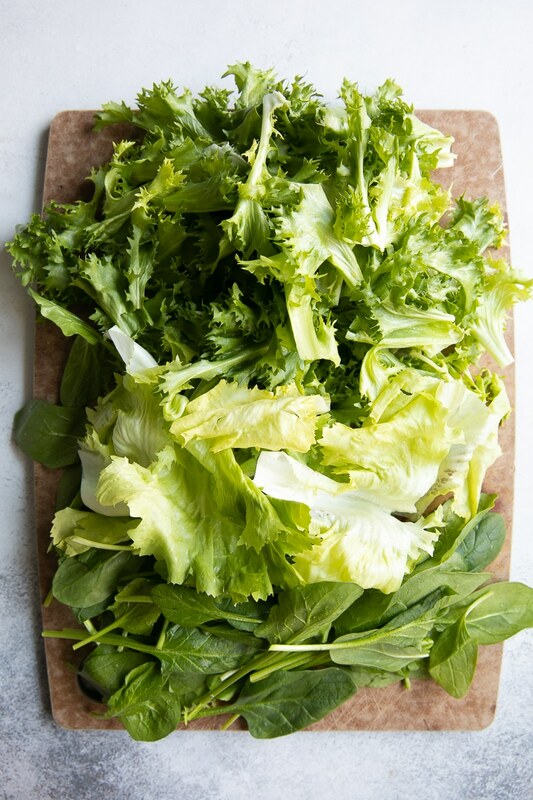 I used a mixture of all three leafy greens- curly endive, escarole, and spinach (see images above). I made your wedding soup recipe yesterday and it turned out perfect! Even my picky 3 yr old loved it. That is awesome feedback – thank you!